Starting over 20 years ago with her first green iguana inherited from a friend who passed away, Cindy Steinle embraced the reptile and amphibian community as a way of life. Currently she is a volunteer with several organizations including her own reptile and amphibian rescue, Small Scale Reptile Rescue, in Milwaukee, Wisconsin, where she works with a number of local shelters, agencies, and organizations to provide rescue services for her community. 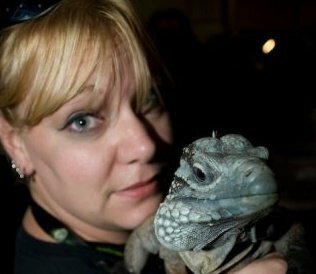 Cindy Steinle will be a panelist at the free National Reptile and Amphibian Law Symposium in Washington D.C., March 7-8, representing Small Scale Reptile Rescue and the Chicago Herpetological Society. For more information and to register to attend, please click here. Since 1993, Kamuran Tepedelen of Bushmaster Reptiles has been a leading U.S. reptile and amphibian breeder, importer, exporter, and broker, supplying unique and exotic wild caught and captive born herpetofauna to zoos, private businesses and hobbyists, and the pet trade. Before starting the company, Tepedelen was a hobbyist and breeder of rare and unusual rat snakes, many of which were undescribed in scientific literature. He has traveled extensively around the globe looking for reptiles and amphibians in the wild, with a focus on Southeast Asia, and specializes in the herpetofauna of Indonesia and its thousands of islands. Tepedelen is directly responsible for the discovery of more than 18 new undescribed species of reptiles and amphibians. With breeding facilities in Asia, Europe, and North America, Bushmaster Reptiles is a long-established importer and exporter of pythons, tortoises, skinks, and many other species, and Tepedelen deals regularly with reptile laws and regulations on three continents, with a focus on CITES import/export regulations. He has attended several CITES COPs as an adviser to PIJAC on issues involving the reptile Industry. Bushmaster Reptiles' Kamuran Tepedelen will be a panelist at the 2013 Reptile and Amphibian and the Law Symposium. For more information and to register to attend the event in Washington, D.C., March 7-8, please click here. Joan Galvin is a senior adviser at Kelley Drye & Warren LLP, an international law firm founded in 1836, in the firm's Washington, D.C. Government Relations and Public Policy practice group, and in this role acts as an advisor to the United States Association of Reptile Keepers. With a strong background representing client interests before Congress and numerous federal agencies, Galvin concentrates in the areas of appropriations, agriculture, biotechnology, marine science, transportation and wildlife and environmental law. She develops and executes strategies to secure state and federal funding on behalf of clients. She lobbies at the federal, state, local and international levels, and builds industry coalitions to support client interests. Prior to joining the firm, Galvin was a principal with the Livingston Group, where she focused on appropriations, agriculture and environmental matters. For the past ten years, she has participated as a non-governmental observer and monitored issues on behalf of industry clients under the Convention on International Trade in Endangered Species (CITES), Convention on Biodiversity (CBD) and World Animal Health Organization (OIE). She also previously served as director of Communications, Public Relations and Government Relations for Mote Marine Laboratory and Aquarium, a private non-profit marine research laboratory and aquarium, for which she obtained state and federal funding for marine research and education projects. For seven years, Galvin served as vice president for Government Relations at Feld Entertainment, Inc., the parent company of Ringling Bros. and Barnum & Bailey Circus, Disney on Ice and Siegfried and Roy. She lobbied at the federal, state, local and international level on behalf of Feld’s interests and developed industry coalitions. Galvin focused on international environmental and agricultural law, including the Endangered Species Act and Animal Welfare Act. She was responsible for spearheading Feld's efforts to develop conservation programs in situ and ex situ on behalf of the Ringling Bros. Center for Elephant Conservation, a private program dedicated to the study, conservation and captive breeding of Asian elephants. Joan Galvin from the United States Association of Reptile Keepers and Kelley Drye & Warren LLP will be a panelist at the free National Reptile & Amphibian Law Symposium and Workshop in Washington D.C., March 7-9. For more information and to register to attend, please click here. Dr. Wilbur Amand from the Association of Reptilian and Amphibian Veterinarians will be a panelist at the free National Reptile and Amphibian Law Symposium in Washington, D.C., March 7-8. For more information and to register to attend, please click here. In an attempt to curtail the incidence of turtle-associated Salmonella infection in children, federal regulations restricting the sale of turtles 4 inches and less and their eggs became law in 1975. Enforcement of this law, 21 CFR 1240.62, often referred to as the "federal turtle ban" or the "4 inch law," is tasked to the Food and Drug Administration (FDA) and its Center for Veterinary Medicine (CVM). Dr. Michael Murphy was born and raised in Dallas, Texas, received his BS, DVM, and PhD degrees from Texas A&M University, and his JD from William Mitchell College of Law in Minnesota. He is a professor emeritus of the University of Minnesota, where he taught veterinary and graduate students and conducted diagnostic veterinary medicine and toxicology-oriented research for 22 years before joining the FDA. He now serves as a Veterinary Medical Officer in the Division of Surveillance in the Center for Veterinary Medicine at FDA. The CVM's mission is to protect human and animal health. 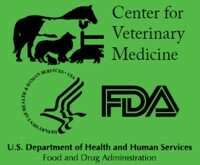 The Division of Surveillance accomplishes this mission by evaluating the safety and effectiveness of marketed-approved and unapproved animal drugs, medicated feeds, veterinary medical devices, and other veterinary medical products. The Division coordinates with other Divisions in CVM to decide jurisdiction, develop enforcement strategies, obtain expert witnesses, and work on scientific, compliance, and regulatory issues. Dr. Michael Murphy will be a panelist discussing the role of the USDA in enforcing the policies and regulations of the 4 inch turtle law at the free National Reptile and Amphibian Law Symposium and Workshop in Washington, D.C., March 7-8. For more information and to register to attend, please click here. While the public mainly thinks about zoos for the work they do with exotic species like lions, tigers, and giraffes, much of their critical and often unsung work revolves around endangered native species. They serve as an "ark" for species threatened or endangered in the wild. Often zoos will be brought in to work with federal and state agencies, as well as private organizations, to provide assessment and oversight of species, and often manage their recovery plans. 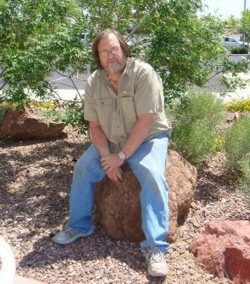 In this role, Doug Hotle of the Albuquerque Biological Park has worked with a variety of native species, including the Dunes Sagebrush Lizard, and is currently working on a program that focuses on restoring New Mexico's rarest reptiles and amphibians like the Mexican garter snake, sand dune lizard, northern leopard frog, Sacramento Mountains salamander, and Jemez Mountains salamander. Hotle has been active as a professional herpetologist for about 30 years and has worked at several AZA institutions as a keeper, senior keeper, manager, general curator, and an executive director. 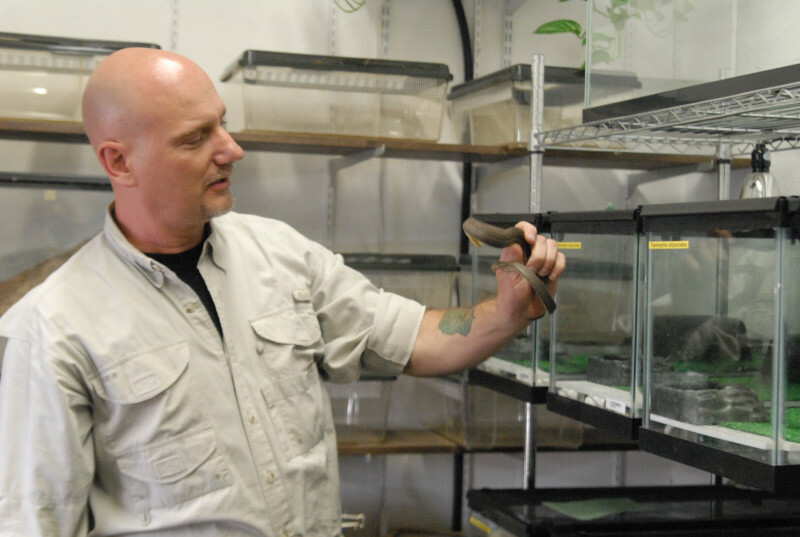 In addition to improving husbandry and propagation techniques with zoos, Doug has served as a contract biologist for the state of Indiana and US department of the Navy, heading up a Timber rattlesnake conservation program where he served as primary investigator for seven years. He routinely assists in training for individuals who come in contact with venomous snakes as a part of their occupation and has also worked as Curator of Herpetology for the Natural Toxins Research Center at Texas A&M University-Kingsville where he oversaw the husbandry at serpentarium of over 500 venomous snakes, performed daily venom extractions and conducted research on the biomedical applications of snake venoms. 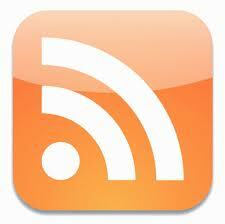 Hotle has published for both general audiences as well as in peer-reviewed journals. Currently Hotle serves as Curator of Herpetology for the Albuquerque Biological Park, and is working in conjunction with state and federal agencies on conservation programs for native endangered herps in New Mexico. 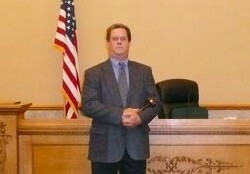 Doug Hotle will be a panelist at the free National Reptile and Amphibian Law Symposium in Washington, D.C., March 7-9. For more information and to register to attend, please click here. Steve Olson, Director of Governmental Affairs for the Association of Zoos and Aquariums (AZA), received his B.S. and M.S. in Wildlife and Natural Resources Management from Colorado State University. In 1985, he began working for the Texas A&M Sea Grant College Program as a research specialist working on marine mammal and protected marine area management issues. In 1987, Olson was selected as a John Knauss Sea Grant Fellow for the U.S. House of Representatives' Merchant Marine and Fisheries Committee. Since then, he has worked for the National Association of State Universities and Land-Grant Colleges as the Director of Federal Relations; the National Oceanic and Atmospheric Administration’s Sanctuaries and Reserves Division as the Project Manager for the Hawaiian Islands Humpback Whale National Marine Sanctuary; and the National Coastal Resources Institute as Executive Director. He came to AZA as Director of Governmental Affairs in March 2000. Founded in 1924, the AZA is a nonprofit organization dedicated to the advancement of zoos and aquariums in the areas of conservation, education, science, and recreation. With more than 200 accredited members, the AZA is a leader in global wildlife conservation, and the public's link to helping animals in their native habitats. The AZA Government Affairs Department represents the interests of AZA before Congress and federal agencies. The department monitors federal legislation and regulations, analyzes the impact of bills and regulations on AZA members and develops position recommendations with the Government Affairs Committee and the AZA Board of Directors, supplies information on legislation and regulations to its member institutions, and works with government officials on developing effective Federal legislation, regulations and partnerships. In addition to his AZA government affairs responsibilities, Olson also sits on the steering committees of the State Wildlife Grants Coalition, the Multinational Species Conservation Fund Coalition, the Endangered Species Coalition, the Joint Ocean Commissions Initiative Coalition, the Bushmeat Crisis Task Force, the Coalition Against Wildlife Trafficking, International Air Transport Association Live Animals Advisory Board, the Global Tiger Initiative, the USDA Contingency Plan Task Force, the Zoo Animal Health Network, Wildlife Alliance and the Federal Museum Working Group. Steve Olson of the AZA will be a panelist at the free National Reptile and Amphibian Law Symposium and Workshop in Washington, D.C., March 7-9. For more information and to register to attend, please click here. National Reptile and Amphibian Law Symposium panelist Elliott R. Jacobson PhD, DVM, DACZM, is currently a Professor of Zoological Medicine at the Department of Small Animal Clinical Sciences in the College of Veterinary Medicine at the University of Florida. The author or co-author of 250 refereed scientific papers and 37 chapters in texts, he has edited and co-edited four books and has been either the principal or co-principal investigator on 83 funded projects since 1978. Many of his papers are the first description of certain infectious agents in nondomestic species. Several of these descriptive reports have evolved into long-term research projects. 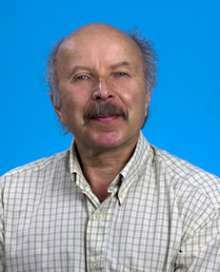 Over the last 34 years he has worked on health problems of a wide variety of amphibians, reptiles, birds, and mammals. His laboratory focuses on infectious diseases of wildlife and zoo animals, with an emphasis on reptiles including the development of serologic assays and molecular diagnostic assays used to determine exposure to and infection with certain pathogens. Born in Brooklyn, NY in 1945 and attending Brooklyn College of the City University of New York, he earned a BS degree in Biology in 1967 and went on to earn a Master of Science Degree at New Mexico State University in 1969 where he worked on the physiological ecology of snakes. Attending graduate school at the University of Missouri he earned a PhD in Zoology and then dually enrolled in graduate school and veterinary school going on to earn a DVM and PhD in Zoology in 1975. From 1975 to 1977 as a faculty member in the Veterinary Science Department at the University of Maryland and wildlife veterinarian for the state of Maryland, he worked on various epizootics of waterfowl in the Chesapeake Bay. Elliott R Jacobson arrived at the University of Florida in 1977 and is currently a Professor of Zoological Medicine, Department of Small Animal Clinical Sciences in the College of Veterinary Medicine. He is also a member of the Zoological Medicine Service, Veterinary Medical Center at the University of Florida where he serves as a clinician and teaches veterinary students and graduate veterinarians in a zoological medicine residency-training program. Since 1979, Dr. Jacobson has advised 30 residents and has advised or served on the committee of 18 graduate students. Almost all of former residents are employed in major zoological institutions and aquariums scattered across the United States. In 1986 he became a Diplomate of the American College of Zoological Medicine. Dr. Jacobson has also been a reptile hobbyist since childhood, keeping and breeding a wide range of reptiles over the years. He currently keeps about 120 snakes. Appearing as a panelist at the NRAAC Reptile and Amphibian Law Symposium and Workshop March 7-8 in Washington D.C., Dr. Jacobson will represent the University of Florida and event co-hosts the Association of Amphibian and Reptile Veterinarians. For more information and to register to attend, please click here.